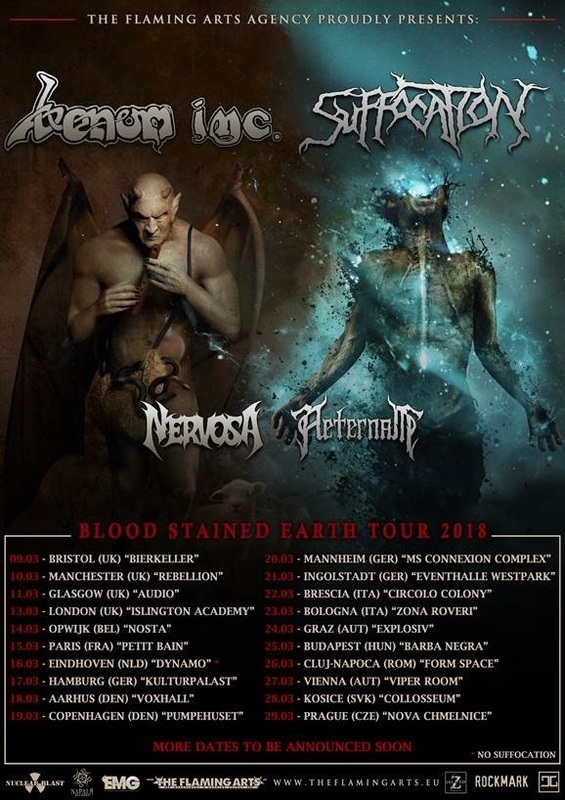 VENOM INC., the band featuring original VENOM members Jeff “Mantas” Dunn (guitar) and Anthony “Abaddon” Bray (drums) alongside ex-VENOM bassist/vocalist Tony “Demolition Man” Dolan, will join forces with U.S. death metal squad SUFFOCATION for a European tour in March-April 2018. Support will come from Brazilian thrashers NERVOSA and Canadian ethnic symphonic metallers AETERNAM. VENOM INC. was born during an impromptu live set at 2015’s Keep it True festival in Lauda-Königshofen, Germany. The onstage reunion was a rousing success amongst VENOM fans and music industry personnel alike, and although it was originally only set up for fun, Dolan began receiving numerous show offers for VENOM INC. from booking agents around the world. What started as a live set to celebrate VENOM‘s legacy immediately turned into a serious reunion discussion. SUFFOCATION‘s latest album, “…Of The Dark Light”, was released on June 9 via Nuclear Blast Records. The disc was produced by SUFFOCATION and tracked at Full Force Studios with longtime engineer Joe Cincotta (OBITUARY). Mixing and mastering was handled by world-renowned producer/engineer Chris “Zeuss” Harris (HATEBREED, ARSIS, SUICIDE SILENCE). Cover artwork was created by Colin Marks (ORIGIN, FLESHGOD APOCALYPSE, KATAKLYSM).